Drawing arena-sized crowds with his vision for healing America, Bernie Sanders has been called by some a political "rock star." 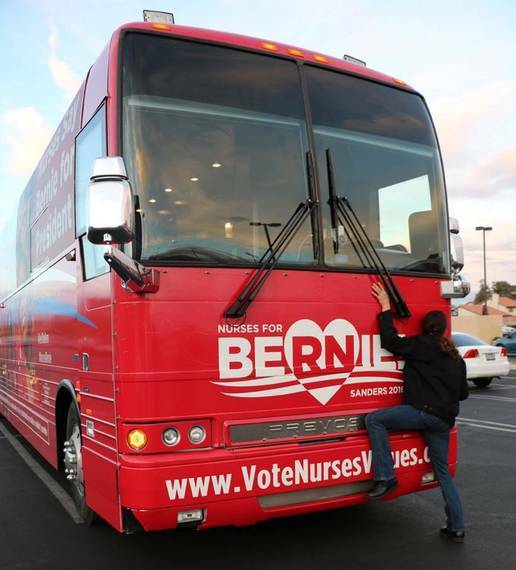 This week, National Nurses United launched a bus to cross America for the social and political movement Sanders champions -- the #BernieBus, a bright red vehicle for change. 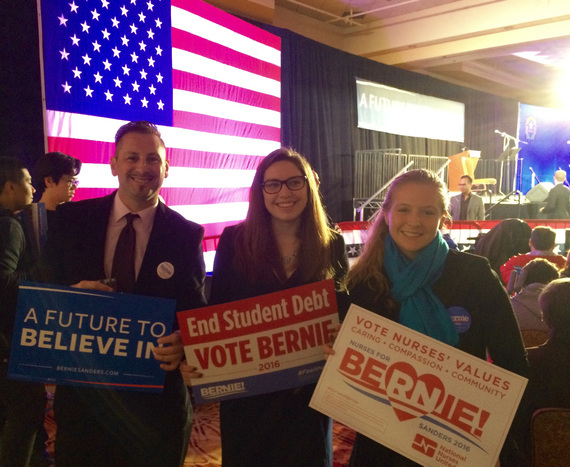 Why would nurses hit the road for Bernie? Because his movement is our movement. Sanders himself has said many times that this campaign is not just about him; it's about a political revolution of everyday people. It's about all Americans standing up, together, and saying no to politics as usual, establishment economics and establishment politics, that "enough is enough." 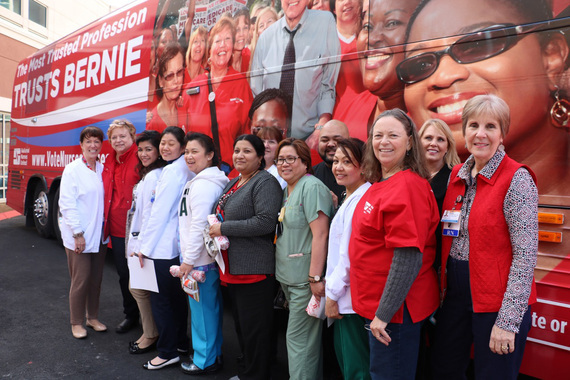 To that end, the #BernieBus tour is nurses' way of showing that the most trusted profession (16 of 17 years running in the Gallup poll)--trusts Bernie. 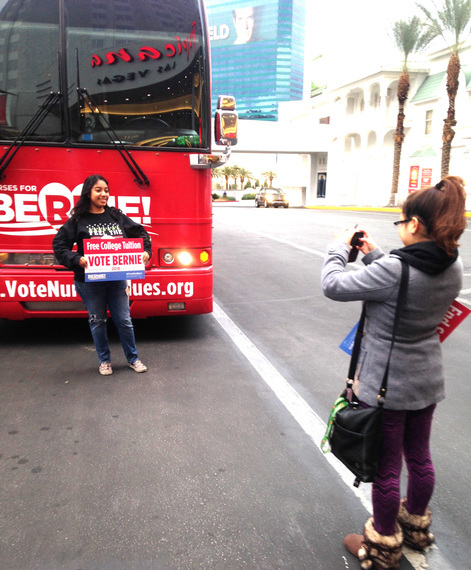 Look for us on the road, and check out the hashtag #BernieBus for sightings. Our nurse members--who every day see the devastating health impacts of economic, environmental and racial injustice--know what's at stake in this election. And that's why they're stepping beyond the bedside, to share with the public, using their own personal stories, exactly why the status quo needs to change. Along the way, nurses will meet with voters, community groups, students and other supporters. We'll be at local events, parks, basketball games, colleges--even hospitals, where our nurses can speak to their cohort about Bernie's platform for change. And our bus and messengers are already drawing notice, as in this national ABC news report. 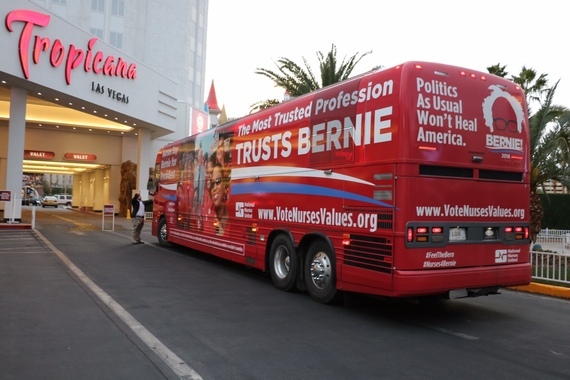 The #BernieBus debuted this week in Las Vegas. 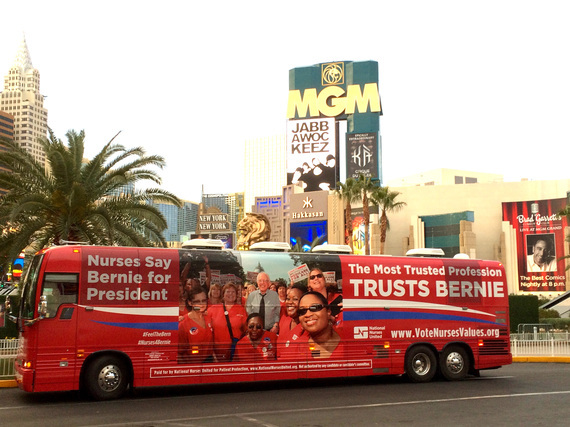 It first stopped outside the Tropicana Las Vegas where our nurses and allies (the bus also features members of Labor for Bernie, People for Bernie and Millennials for Bernie) joined a Future to Believe In rally--and then outside the Battleground First in West Dinner at the MGM Grand, both attended by Sanders. 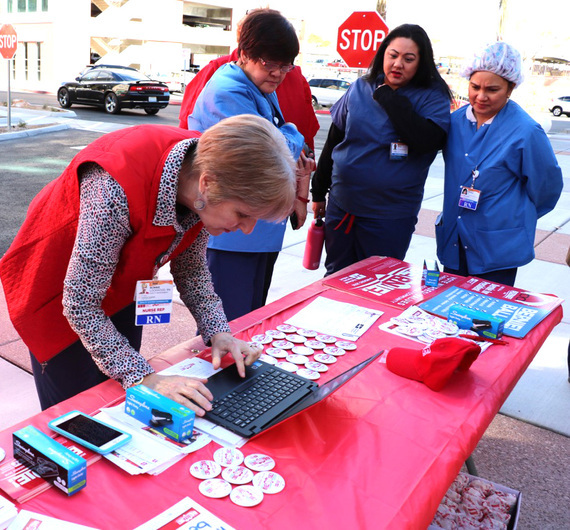 The next day, the bus brought nurses to meet with other hundreds of RNs at Las Vegas area hospitals, registering them to vote, getting pledges from nurses to participate in the February 20 Nevada caucuses. At one hospital, St. Rose Dominican RN Sue McHugh enthused about the visit. 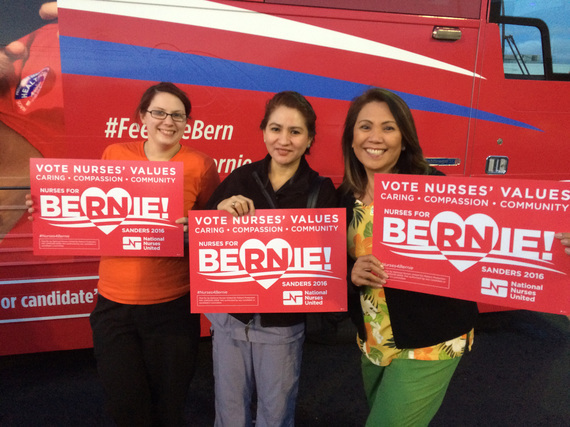 "My RN colleagues and I loved greeting the Nurses for Bernie bus this morning. 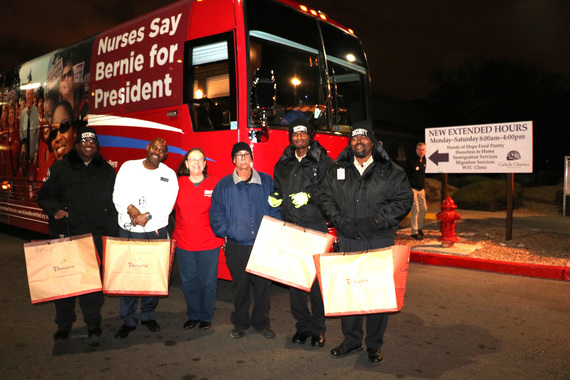 That big red bus represents RNs, our values, and our political strength." Speaking to ABC News in front of another hospital, Melanie Sisson, RN, said she has hosted a house party for Bernie because " he is so supportive of nurses values, of seniors, of young people" of people of all ethnicities and backgrounds. As nurses, said Sisson, "we take care of patients every day. We see the effects of the lack of health care. We have the Affordable Care Act; it's not enough. We need single payer (Medicare for all) because people still can't afford their co-pays. And Bernie has been out front on single payer forever." Deborah Burger, RN an NNU co-president, told the reporter that "we have a long history of political activism and getting our nurses involved. Everything is politics even if you don't believe in politics. We're here to highlight to nurses the importance of being involved in who makes decisions in the federal government, and we believe Bernie Sanders is the one who can really get things changed in the U.S."
"Nurses are signing in for updates on the bus, registering to vote, pledging to turn out for caucuses, and making sure Bernie Sanders is the next president... we're going across country, to Iowa and back to Nevada for the caucuses. We're really excited about it." The bus ended the day dropping off food to homeless Nevadans at a Catholic Charities site. From Nevada, the #BernieBus will make its way across the country, to the first voting state, Iowa, for its February 1 caucuses, via stops in Denver and Kansas City, before returning to Nevada for its February 20 caucuses. While some candidates seek to divide us, our nurses are thrilled to travel the country, to meet new people, and to talk about what matters. In the call for enacting change by standing united, how could we feel any more like a people's revolution, than by spending time face-to-face with everyday people across the country? 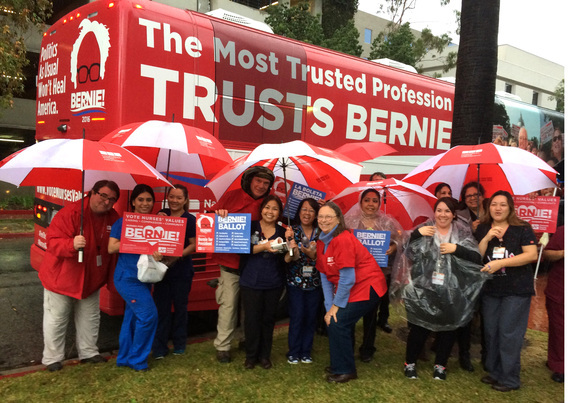 If you spot the #BernieBus in your town, stop by for some Sanders swag and to meet the hardworking nurses whose concern for public health extends far beyond the walls of the hospital. There's nothing more "rock star" than joining a candidate and a movement to reclaim our country.